A powerful mix of soulful sounds, African rhythms, blues riffs and classic rock, this collection from ValLimar Jansen will stir your soul and bring you closer to God. An inspirational speaker, singer and storyteller, ValLimar Jansen is well known for her powerful voice and captivating presence. This collection of soul-stirring music offers the energy and joy of a concert with ValLimar through 12 songs filled with faith, hope and love. Not so much soul music, but music for the soul. This is music that brings you closer to God, music that moves you. 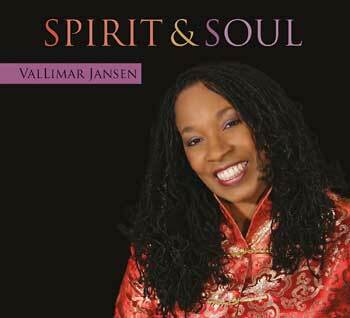 Unlike ValLimar's previous collections, Spirit & Soul features popular contemporary songs from fellow Spirit & Song composers produced and sung with ValLimar's signature style, blending soulful sounds, African rhythms and blues riffs with classic Christian rock. All these styles come together with the help of a group of instrumentalists and singers boasting some rather impressive resumes. From praise and worship to lush, cinematic treatments and a rousing gospel anthem calling for peace, this album is filled with music that touches the soul. ValLimar's funky take on "Be Lifted High" opens up the collection and will have you amped and ready for all that is to come. "Can We Love" features some truly amazing vocals from ValLimar and leads us to reflect on the Christian life we are living. The liner notes sum this collection up perfectly: "This is not a gospel record or even a praise and worship record, yet all those elements are here. This is a soul experience. This is a love experience." Did I hear an "amen"? Inspirational speaker, singer and storyteller, ValLimar Jansen is well known for her powerful voice and captivating presence. Now, this collection of soul-stirring music offers the energy and joy of a concert with ValLimar through 12 songs filled with faith, hope and love. This isn't so much soul music, but music for the soul—music that brings you closer to God, music that moves you. Featuring popular contemporary songs from fellow Spirit & Song composers, but produced and sung with ValLimar's signature style, this album blends soulful sounds, African rhythms and blues riffs with classic Christian rock. From praise and worship to lush, cinematic treatments and a rousing gospel anthem calling for peace, Spirit & Soul reaches straight to your heart. ValLimar's funky take on "Be Lifted High" launches the playlist by amping you up and getting you ready for more. Further in, "Can We Love," featuring some truly amazing vocals, leads us to reflect on the Christian life we are living.